Polson Bridge | Launceston Then! Polson Bridge by Nick Hairs. 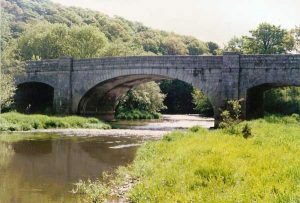 Polstonel, Poulston Brygge, Polston, or Polson Bridge as its known today, spanning the River Tamar about a mile and a half from Launceston, is one on the ancient routes in Launceston. 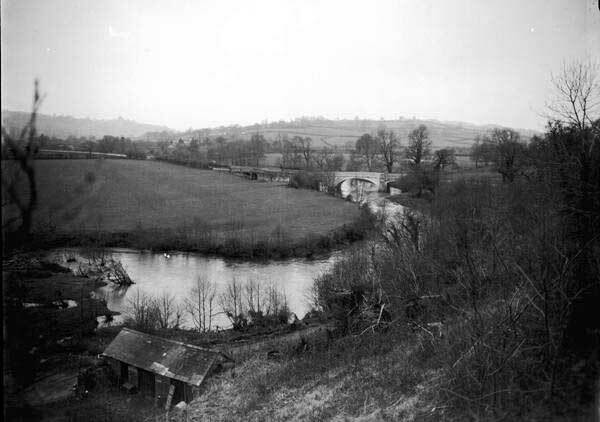 The first bridge was built soon after the Norman conquest, probably sometime in the 12th century, and was the work of the feudal lords of Launceston Castle. It had three main arches, each 17 feet in span, and three floodwater arches. In 1446 the Bishop of Exeter visited Launceston and was apparently so pleased with the entertainment laid on that he granted an indulgence of forty days ‘for the repair of Poulston Brygge.’ Borough accounts for 1466-67 gives credence that Launceston paid for the maintenance of the bridge. At one time, when the court judges were on circuit a watch was stationed on St. Mary Magdalene’s church tower, so that when the judge approached the bridge the town dignitaries could be alerted to prepare to greet him. During the Civil War, Polson Bridge was the scene of skirmishes between Royalist and Parliamentarian forces, indeed, in 1646 the Parliamentarians under Sir Thomas Fairfax destroyed the Bridge, but it was rebuilt. In 1809 the bridge was only 19½ feet wide, with a long causeway approach. With Launceston being a parole town during the nineteenth century, the centre of Polson Bridge marked the limit of the parole area. Prisoners who overstepped the mark could be sent back to Dartmoor Prison. A reward was given to anyone spotting a prisoner breaking their parole, and it was not unknown for an unwitting convict to be enticed across the bridge so that a reward could be thus claimed. 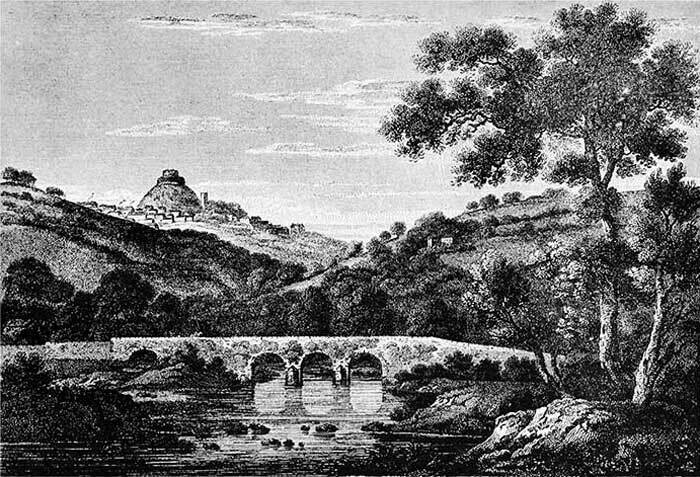 The tenants of the Duchy of Cornwall formerly had quit-rents that were to be performed when the Duke, or later the King entered Cornwall over Polson Bridge. Many of these quit-rents consisted of small gifts, such as Spurs, Salmon Spears, and spices, or the more mundane bundle of firewood. At least they sound more pleasurable than the poor soul who was responsible for ‘holding the kings head’ should he feel sea-sick on a voyage! This became known as the feudal dues, and a ceremony is held for every new Duke of Cornwall at Launceston Castle, with the last one being held in 1973 when Prince Charles duly accepted the dues. 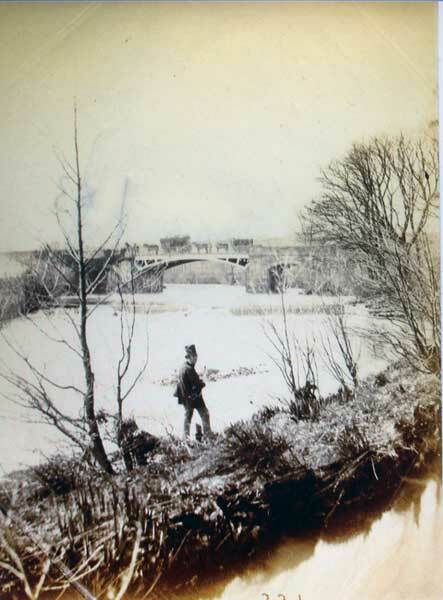 In the winter of 1828, a coach and horses belonging to Mr. Smith of the King’s Arms in Southgate Street, was returning to Launceston was washed away by a flood at Polson, possibly due to the entrance of the bridge being too narrow. Although the driver managed to escape the horses sadly drowned. With these inadequacies the ancient bridge was finally replaced in 1835 to a design by James Green with James Chapple as the clerk of works. The two outer arches were constructed, with an iron span between them. Quite what design this iron span took is uncertain, but it was soon replaced by the single stone arch that now stands. During the work on the bridge in 1835 a curious coach mishap took place. The London mail coach, due in Launceston at a quarter past eleven at night drew up one evening, as usual, at the Arundel Arms, Lifton, and the driver, passengers and guard dismounted, Mr Wilson, agent of the Duke of Northumberland being the only person left in the vehicle. 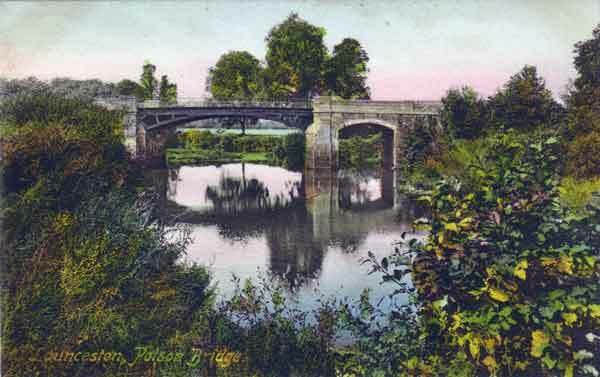 The horses, which included a blind near-leader, suddenly bolted and galloped towards Launceston, and having crossed without accident the temporary wooden bridge at the foot of the hill, halted driverless and breathless at the White Hart Hotel, Launceston, their accustomed stopping place. They were followed by the guard, Cornelius Crowhurst, who had thrown himself on horseback immediately he had discovered their flight and was delighted to find that all was well. 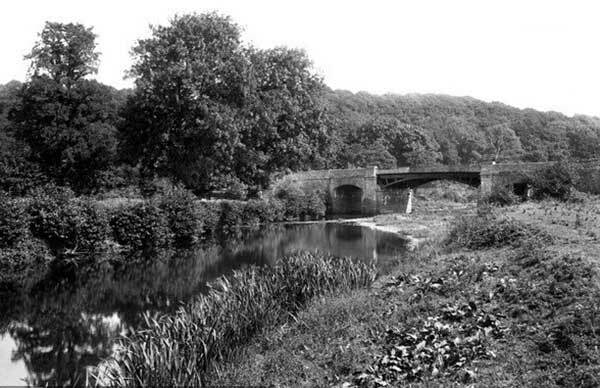 During the Victorian age, the bridge was partially demolished with just the three floodwater arches on the Cornish bank remaining. These were later incorporated into the rebuild, along with a structure of iron girders and reinforced concrete and then faced with stone. 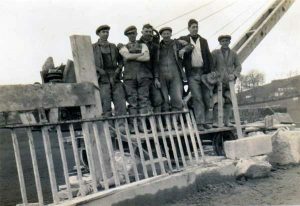 Polson Bridge gang in 1934. Photo courtesy of Colin Hill. By 1931 the two counties had become concerned about the strength of the centre arch under the increasing flow of heavy traffic and so the iron girders were replaced in 1934 with a reinforced concrete arch faced with masonry (left). 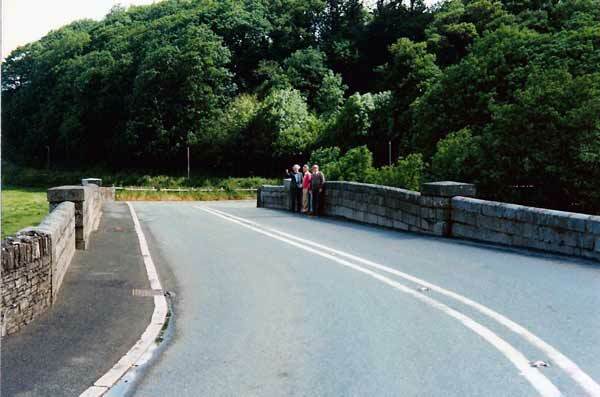 With the completion of the Launceston by-pass in 1976, the flow of traffic has been drastically reduced and the bridge now carries the A388 across the Tamar. 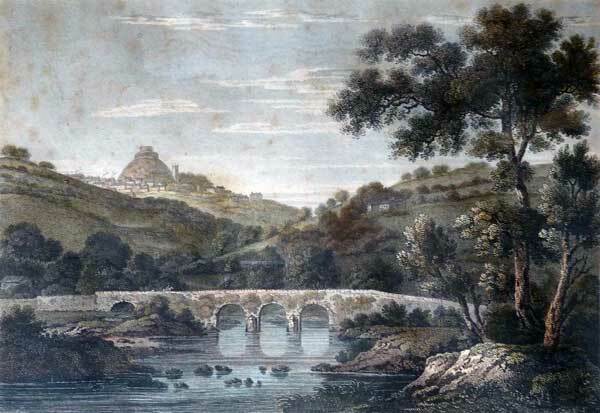 Polson Bridge in 1813 by Joseph Farrington. Looking down upon Polsson Bridge in 1943.